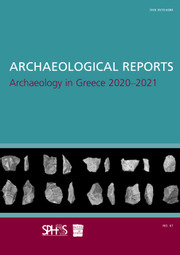 Archaeological Reports is published by the Society for the Promotion of Hellenic Studies and the British School at Athens, for their subscribers. 'Archaeology in Greece', compiled annually by the Director of the British School at Athens, is the only account of recent archaeological work in Greece published in English. It is supplemented each year by a regional report on archaeology and research from other parts of the ancient Greek and Byzantine world: South Italy, Sicily, Sardinia, Albania, Cyprus, Asia Minor and the Black Sea are covered regularly. New acquisitions to UK antiquities’ collections and their conservation also feature.